In all old mystical systems there is the hidden art of “direct transmission”. This is often alluded to – but in most cases never revealed. Many modern so called “masters” often deride it as “hocus pocus” but on investigation never studied under a genuine master or if they did, didn’t stay long enough or possess the necessary talents to receive the “family” transmissions. The thing is, you only have to look a some masters to see that they possess that certain kind of “magic”, not only in their Martial Arts movements but in everything they do. They are happy, contented, sociable and incredibly powerful and fluid in everything they do. Invariably they never boast of having received the transmissions, those that boast and advertise, invariably haven’t. The Kung Fu world means that the students have to search and work it out for themselves. The Martial arts are littered with clues, the Japanese call it “Jikiden”, the Iaido style that I studied is called “Muso Jikiden Ryu” meaning “visionary style of direct transmission”. So the idea was not unfamiliar to me, in western magic you undergo “initiation” with rituals and symbols with a high priest or priestess where you “yield” to their manipulations so that they can increase your links to the higher power or energy. I came into contact with “Chap Sau” in my lessons with Jim Uglow in the UK and Ma Lee Yang in Hong Kong. My experience really was quite profound, Jim would manipulate my hands to “soften” my elbows get my shoulders to “sit” on my lats, and “settle” my back, hips and legs until I found the energy line from hands to feet. He would “fiddle” until everything came alive. So I figured who better to talk to on your behalf to try and get the best idea of how it worked………. 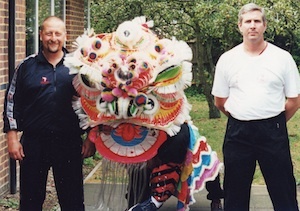 Jim was “Chap Sau’d” by none other that Kong Pui Wai, the current Chairman of the Hong Kong Martial Arts Association and lineage holder of Hung Gar Kung Fu. Kong Pui Wai was Chap Sau’d through the famous lineage of Hung Gar master Chan Hon Chung who in turn was Chap Sau’d by the Master Lam Sai Wing who in turn was Chap Sau’d by the famous Wong Fei Hung. In Tai Chi he is Chap Sau’d by Ma Lee Yang, the head of the Tai Chi Yang family and daughter of the famous Yang Sau Chung. SR Jim, how would you describe Chap Sau? JU It’s not easy, it’s a method of putting the body into it’s most natural state to be able to produce power and health. It involves getting the secrets of the art into the body from a generation that holds the lineage and secrets to pass down. SR How would you describe the results? JU Extreme relaxation of the mind and body, increased health and incredible power. You then have the responsibility to absorb the knowledge into your body with hard training and intense study. Chap Sau gives you your first “guided experience” and you then have the task of recreating it on your own…….but the power is not guaranteed. SR To your knowledge, who now uses “Chap Sau”? JU Kong Pai Wai, has the full Chap Sau passed down through the lineage from the originators in Hung Gar (described above) and is able to Chap Sau to highest level. SR What about in Tai Chi? JU My personal experience is with Ma Lee Yang who received thousands of hours of Chap Sau from her Father (Yang Sau Chung) studying with him on a daily basis for twenty nine years! He in turn received it from his Father the most famous Yang Chen Fu and his uncle Yang Shao Hu, Yang Chen Fu’s elder brother. SR Do many schools still possess this system? JU I don’t know, one of the results of this system is that the school becomes relaxed and the students happy with each other, but they train and study hard. If the students and teacher can’t socialise with each other and train hard together, then the “Chap Sau” probably isn’t fully realised. SR Would you say that there are many instructors around in the Kung Fu world that haven’t ever experienced this? JU Probably, I have been training “in the system” for over twenty years and although it was being done to me from day one, it was only “formally” done on me in ’92. I started in ’85 with Chan Hon Chung “Chap Sau’ing” me and I didn’t know what it was! So it’s possible that you are learning it and don’t know what it is until someone decides to tell you and “formalise” it. Of course the teacher has to have the lineage and the full transmission otherwise you only get a “form” of it. SR How would you describe you own personal experience of Chap Sau? SR Can you tell the readers the story of how your entire school came to be Chap Sau’d? JU For twelve years I was inviting Kong Pui Wai over to England to visit my school and he would always say that he was “too busy”. Then on the twelfth year he formally announced to everyone in Hong Kong that he was coming over to “Chap Sau” my entire school! You can imagine the shock in Hong Kong and to me! Teaching for money is normal, “special” people like Kong Pui Wai cannot be bought and as he has the full Chap Sau formula, he has spiritual and moral obligations with regard to it’s teaching, so this really was a special event! The words “Chap Sau” can mean many different things and the entire formula goes into the parts that nothing else reaches! SR How did it effect your school? JU We didn’t have a miserable school in the first place, but it’s acted like a healing formula, everyone feels happier and more settled. They all come in and study to “remember” the internal guidance that he gave to them individually and as a group. To have received this guidance individually from such a high level master has changed them all. SR How did the Chinese view this? JU It’s a great honour and extremely rare to receive this from such a high level master, so I think they were quite surprised! SR What’s your experience in Tai Chi with Ma Lee Yang? SR To receive it from Ma Lee so quickly, did it come as a shock? JU Did it! To have waited so long in Hung Gar and then receive it directly from Ma Lee was a shock. I received it orally first to get the idea of each posture in the form and then had it manipulated by finger pressure to confirm it. She accepted my twenty year “apprenticeship” and knew that my Hung Gar school was well known to have the full Chap Sau formula and to teach it so she knew that I knew what she was doing. It was easier for her because she didn’t have to teach me the concept, however she still had me as raw material! SR How would you describe the necessary relationship between instructor and student for the Chap Sau to take place? JU You have to enjoy each others company or there’s no chance of ever getting anywhere. You have to have faith in the teacher and be able to confirm that the posture that they have shown you is better than the one before. You have to realise the suffering, practise and study that they have put in to get this ability and be prepared to do the same……….. often hours in one posture! SR So you would say that you need to have established a long tem relationship before it can happen? SR So what’s your advice to any Kung Fu student looking for that kind of teaching? JU Look for the right teacher, with the right lineage and the right time spent with a famous master who has received Chap Sau, look at his/her ability, ensure that you can establish the right kind of relationship with them and then be prepared to yield to the teachings and work very, very hard!